Providing a safe transportation network across Alabama that extends to multiple modes of transportation, including bicycles, is an important element of the mission of the Alabama Department of Transportation. Bicycling allows people of all ages to access everyday needs -- work, education, health care and shopping. As this mode of transportation increases across the state, a range of policies, plans and standards have been developed to integrate bicycling safely into the overall transportation system. 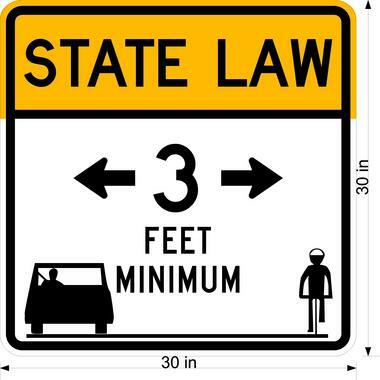 Alabama law requires motorists to allow a minimum of three feet of clearance between their vehicle and the bicycle they are passing on the road. So, follow the rules of the road and watch out for each other! View our TV Spot "Give 3 Feet"
SAME RULES OF THE ROAD APPLY. Remember that bicyclists have the same rights as people behind the wheel. WHEN ROADS ARE NARROW and passing with a 3-foot buffer is not possible, slow down and wait to pass when safe. IF YOU ARE TRAVELING OVER 25 MPH, operating a large vehicle or on a multi-lane street, always give more than 3 feet or change lanes completely to pass.